If you are needing a fresh approach to marketing your product, Google AdWords offers it all. Put your message in front of potential customers right when they’re searching for what you have to offer. Your ad is only presented to an Internet user who types in a keyword that appears on your website. Example: A user searches for a fire extinguisher – Only Adwords that sell or service fire extinguisher are presented on the right hand side of the search panel. If they click on your ad, you pay a small fee; if they don’t your ad is free. This is called ‘Pay per Click’ advertising. 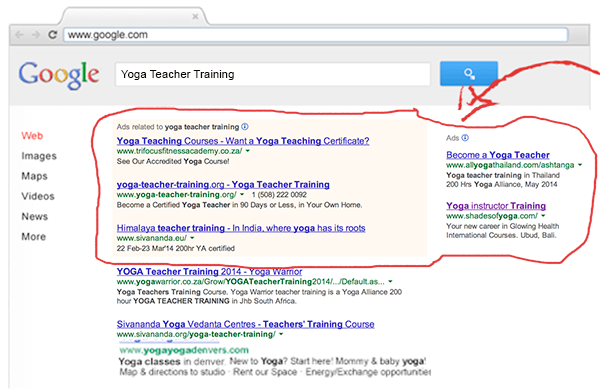 Your advert appears at the top or side bar Google searches. Prime position for targeted results. With AdWords, you can set your daily ad budget and change it whenever you want. And you only pay when potential customers click on your ad to visit your website. They’re your ads. So whenever you want, you can adjust your budget, change your ad copy and pretty much anything else about your campaign, right within AdWords. Where are your customers? You can tailor your AdWords campaign so that your ads appear to people just in your town or state, or all around the country or even the entire world. 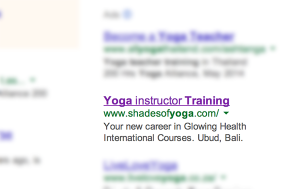 The amazing part about Google Adwords is their ability to target your market so specifically. You can choose to advertise internationally or locally or even target countries around the world that you know would benefit from your services. You can also manage when your adverts are displayed, eg: if you are closed during December then close down your advertising campaign during that time or if you are offering accommodation but are fully booked for certain periods then rather activate your advert during your quiet times. With AdWords, you always know what you’re getting for your money. Our maintenance contract ensures you detailed reports. You can tell what’s working, what isn’t, and how you can improve your campaign. Elemental will work with you to ensure we test and monitor until we are getting the results we aimed for. Elemental was awarded one of the TOP 100 Adwords agencies in South Africa in 2013 One of our skeptical clients took a one month trial Google AdWords campaign with us. Can you guess which month it was? In summary – Why Adwords? You control where your ads are displayed e.g. which continents, countries, regions, cities, and at what time of the day. Google will collect data from your ads performance and the behaviour of your visitors, so that the Adwords manager can fine-tune the campaigns for maximum return on investment. Google, using the data harvested from millions of users, tells you what products and services people are looking for!